Did you know that there are some U.S. states that have already officially fallen into recession? Economic activity all over the planet is in the process of slowing down, and there are some areas of the country that are really starting to feel the pain. In particular, any state that is heavily dependent on the energy industry is hurting right now. During the years immediately following the last recession, the energy industry was the primary engine for the growth of good paying jobs in America, but now that process is completely reversing. All over the U.S. energy companies are going under, and thousands upon thousands of good jobs are being lost. As economists size up the chances of the first nationwide slump since 2009, pockets of the country are already contracting. Four states — Alaska, North Dakota, West Virginia and Wyoming — are in a recession, and three others are at risk of prolonged declines, according to indexes of state economic performance tracked by Moody’s Analytics. The three additional states that are “at risk of prolonged declines” are Louisiana, New Mexico and Oklahoma. What all of those seven states have in common is a strong dependence on the energy industry. Last year, 67 oil and gas companies in the United States filed for bankruptcy, and approximately 130,000 good paying energy jobs were lost. If the price of oil does not go back up, this could be just the beginning. It is being reported that a whopping 35 percent of all oil and gas companies around the planet are at risk of falling into bankruptcy, and the financial institutions that have been backing these energy companies are getting very nervous. Of course things could shift dramatically for oil and gas companies if World War 3suddenly erupts in the Middle East, and that could literally happen at any time. But for the moment the outlook for the energy industry continues to be quite dreary. With 87 percent of the S&P 500 reporting, total blended fourth-quarter earnings have shown a decline of 3.6 percent, according to FactSet. Assuming the trend holds up, it will markthe first time profits have fallen for three straight quarters since 2009. But the road ahead doesn’t get any easier. FactSet is now projecting that earnings will decline 6.9 percent in the first quarter, a stunning move lower over time considering that in September the expectation was for 4.8 percent growth. As corporate profits fall, layoffs are starting to increase. Just the other day we learned that the number of job cuts in this country shot up 218 percent during the month of January according to Challenger, Gray & Christmas. It is starting to look very much like 2008 all over again, and I am convinced that it will soon be much, much harder to find work in America. –U.S. exports were down 7 percent on a year over year basis in December. –U.S. manufacturing activity has been in contraction for four months in a row. –U.S. factory orders have fallen for 14 months in a row. –The Restaurant Performance Index in the United States has dropped to the lowest level that we have seen since 2008. –Orders for Class 8 trucks in the United States dropped by 48 percent on a year over year basis in January. But the mainstream media continues to try to convince all of us that everything is going to be just fine. Earlier today, CNN ran an article entitled “U.S. recession fears fade after market rally“, and the Wall Street Journal published an article entitled “The U.S. Economy Is in Good Shape” that got a tremendous amount of attention. Perhaps things look fine for the moment in New York City or Washington D.C. or San Francisco or wherever it is that these “reporters” write their articles. Unfortunately for hard working Americans like Oxley, what we have seen so far is just the tip of the iceberg. 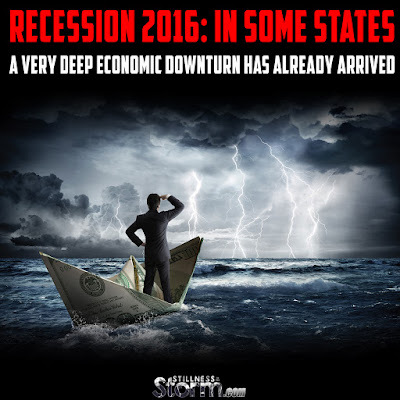 We have entered a long downturn that is ultimately going to be even more painful than the last recession was. And everything changes if Saudi Arabia and Turkey get trigger happy and decide toinvade Syria. If that happens, it could very well be the spark that sets off World War 3 and a full-blown meltdown of the global financial system.